Mrs. John M. (G. G.) Keith sends Martha Berry a small contribution of $10, wishing, though, that she could send more. 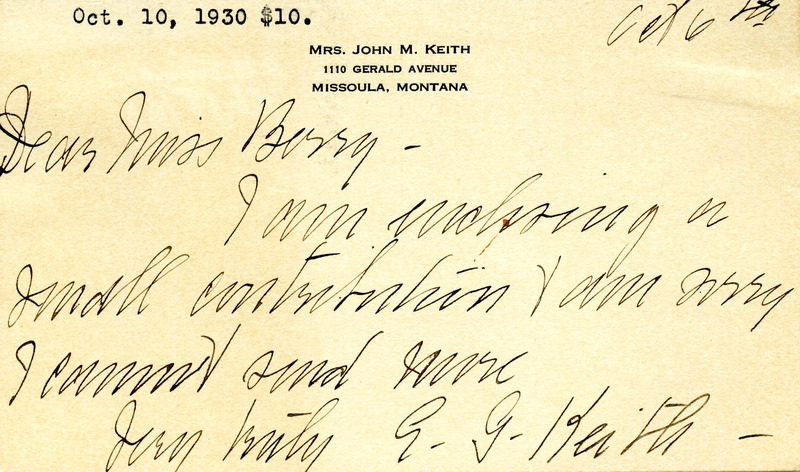 G. G. Keith, “Letter to Martha Berry from Mrs. John M. Keith.” Martha Berry Digital Archive. Eds. Schlitz, Stephanie A., Chelsea Risley, Lindsey Purvis, Jarrett Archer, et al. Mount Berry: Berry College, 2013. accessed April 26, 2019, https://mbda.berry.edu/items/show/13046.